Book One of the “Spindlewood Tales,” is the exciting and gripping adventure of an abused orphan, Pip. About to be sold, literally, to a ship’s captain, Pip seizes the opportunity to escape, only to land in a worse situation. Pip is delivered into the legendary village of Hangman’s Hollow, where the townspeople and the creatures of the forest fight over possession of the children. Children are forced to hide lest they be imprisoned by the forest dwellers. When Pip trudges through a heavy snow, his tracks set in motion a whole series of events: chases through the city streets and through the woods, flying accusations, and battles. He wanders past the local tavern, where the tavern keeper snatches him, keeps him safe, and introduces him to his own son. Pip and the son, Toad, set out to rescue a girl rumored to be hiding. For timid fourth-graders this may be best as a read-aloud since the subject matter is a bit scary. But it should be fine for most independent fourth-grade readers. While Pip and Toad venture forth with little trepidation, they do encounter girl who is paralyzed by terror. However, readers can learn lessons. Things can always be worse, and they can always work at improving their own situations. Also, it seems that even the most innocuous objects can be malevolent. The trees harbor witches. A wooden doll is in fact a malicious soldier from the civil war. Even the birds–though not all of them–report back to the evil creatures. The author-illustrator presents some beautiful and vivid drawings of the settings and many of the characters. They add a lot to the feel of being there. 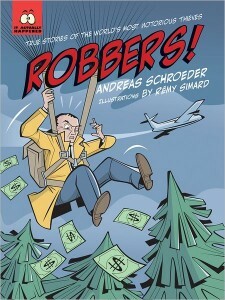 Readers on the 4th grade reading level and up who like adventure and action will enjoy the drama and intrigue in Robbers! True Stories of the World’s Most Notorious Thieves! Presented in chapters this 166-page text provides stories of famous historical robberies. Each chapter presents one robber, an in-depth look at one of their heists, and briefer descriptions of their other crimes. From a team of thieves who stole the Mona Lisa to an individual who hijacked a plane and parachuted as an escape, Robbers! illustrates the creative approaches criminals have taken. But Robbers! doesn’t only highlight illegal successes. 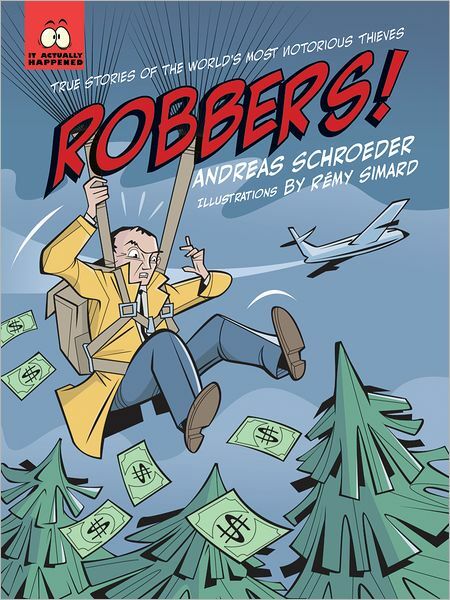 Through stories of criminal mistakes, such as a pair of thieves who didn’t know how to fly their get-away plane to a team who forgot to run the dishwasher (and thus left numerous fingerprints for police to use), this book shows how crooks get caught. Robbers! details criminal techniques such as how to case a bank, how to run pearls over your teeth to determine if they are genuine or fake, and how to act your way through a situation to bluff authority figures. This is information some adults may not want in the hands of young readers so this book might not end up on third grade reading lists; on the other hand, the stories do teach the values of attention to detail, careful work and determination and the book might intrigue risk-seeking students who need practice with their reading skills. A book that highlights criminal action could glorify the thieves or show them as villains. Robbers!, however, presents these histories with a non-judgemental tone. The book concludes with a robber-turned-good – the story of Willie Sutton, a bank-robbing addict who eventually turned his energies to helping banks improve their security. Each story is accompanied by brief cartoon-style illustrations placed in-line with the text. This presentation style requires the cartoon caption to be read as a part of the main text and may confuse some readers, but the illustrations themselves help lighten the book. Every spread includes at least one illustration and some pages include a call out note with additional information. Backmatter includes a chapter-by-chapter bibliography, an index and further reading. Unfortunately all of the books listed in the further reading are at least twenty years old, so may be out-dated and hard for young readers to access. Welcome to medieval France, land of chivalry, monsters, and unexplained events. Translated from the French, this beautifully drawn graphic novel gives fourth graders a glimpse into that world, represented by realistic characters. William has recently lost his father, but the father’s spirit continues to call to William. His sister, Helise, also disappears, so he sets off in search of clues. Brigands run rampant in the area, making it difficult to know who to trust. 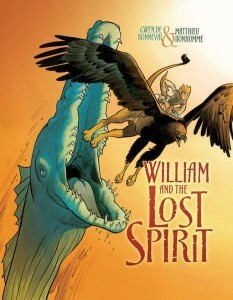 Monsters William encounters include those with no head and a face below their arms, anthropomorphic dolphins, talking plants, and dog-headed men. He crosses the ocean and the desert and catches a glimpse of his father’s hand. He gets help from a variety of characters, including his aunt, a knight, a troubadour, one of the monsters, and a young girl. The girl is required to call herself the only son of a king, just one of the “truths” of that kingdom. On his return, William faces his mother and possible future stepfather who are suspicious at best. His sister turns into a goat. Mom is sometimes a cat. As with most graphic novels, the illustrations are very important, and these do not disappoint. Faces and animals are true-to-life and even the monsters are believable. The battle scenes may be overly realistic. The extensive section about roles in the medieval world, mythological creatures, and gender roles provides added value and should aid students in comprehension. There is also a very good discussion section. The publisher provides materials and information on reading activities through their website: www.lernerbooks.com. Genre: Middle grade, Chivalry, Myth. On the day that Cassie was born, her hometown ceased to be. The mayor flipped a switch and Old Grange filled up with water. Cassie spent her first 11 years in New Grange, hearing stories about a town she never walked through. 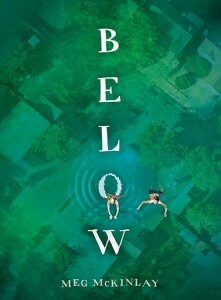 Then, as she and the town rush toward their birthdays, Cassie starts swimming in the lake that buried the town. Her friend Liam joins her and they start exploring. Both of them want to walk the streets visit the buildings and understand the sense of place that their parents take for granted. Their fascination is understandable. It is the centennial year of Grange and everyone is focused on its history. The mayor is preparing for a town celebration, Cassie’s sister has the job of writing the official town book, and Cassie and Liam look. 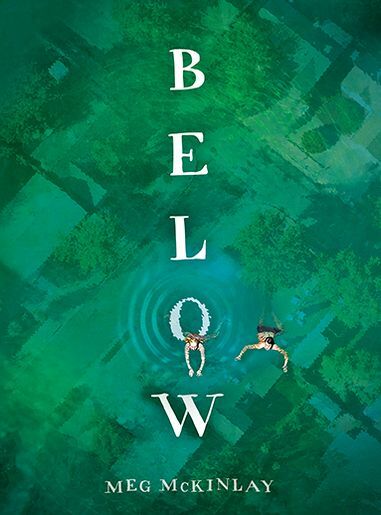 But all of it is just a reach into watery history, until the lake shows Cassie and Liam more. This book is equal parts character and plot driven. Cassie is a lovely, albeit lonely kid, with a strong sense of not belonging, though she is perhaps not the outsider she sees herself as. Liam has similar issues. Their developing friendship gives us room to savor their time together even as we want to rush to the end and find out what happens. The beautiful imagery would make a good read aloud for older classes, though most fourth grade readers will simply want to slurp it up. While this is mostly just a fun book, there is room to discuss broader issues within a class. Cassie’s town was moved so a dam could be built. Are those personal costs figured into the budget? Is it worth moving a town for the benefit of many others even at a high cost to a few? The book won’t provide direct answers to these questions, but may set the reader wondering. I’m writing this review wearing pants, no shorts. My freedom to wear these “outrageous,” “positively sinful,” “scandalous” clothes is due, in part, to Mary Walker and other brave, stubborn women like her. Mary Walker Wears the Pants is a read-aloud biography that tells the story of a mid-nineteenth century woman who became one of the world’s first women doctors. She persistently helped soldiers and civilians during the Civil War, even when no one acknowledged her or requested her help. Walker was a prisoner of war (for her probable role as a spy for the Union), yet after the Civil War, she labored on as a doctor and was eventually awarded the Medal of Honor. Walker also travelled the U.S. and abroad as a paid speaker about her service, imprisonment, and pants! 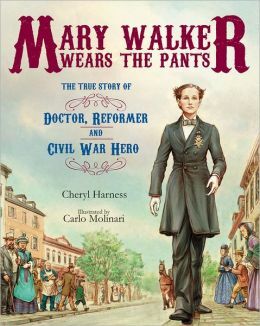 Mary Walker Wears the Pants is well-suited for reading aloud in a fourth grade class as a part of a Civil War or Women’s History unit. 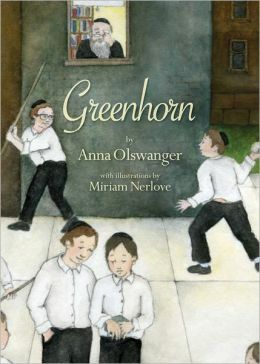 It is also a perfect biography for a fourth grader to read for a biography book report. Carlo Molinari’s illustrations distinctly demonstrate the contrast of what women traditionally wore to what Mary Walker’s pants suits were like. Girls today take for granted the freedom they have to express themselves any way they want, and Cheryl Harness provides a fresh perspective about how fortunate we are to have such stubborn women like Mary Walker in our rich history. Today it’s hard to imagine a society that was so misogynist as it was in the nineteenth and early twentieth centuries, but recalling the odds that many women overcame to gain the rights to get an education, vote, and run for a political office helps us to appreciate these rights that we consider basic. In 17 Women Who Shook the World, Preethi Burkholder gives an overview of the lives of obvious impactful women like Susan B. Anthony, Mother Theresa, and Oprah Winfrey, but readers also learn about the lives of Emmeline Pankhurst, Aung San Suu Kyi, and Meryl Streep whose lives each “shook the world” in their own, unique ways. 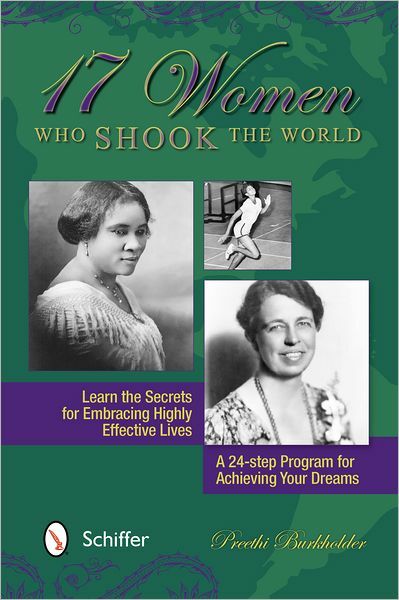 This book does not delve deeply into the lives of these women, but it does give a great outline of these women’s lives and how their efforts affected the world. At the end of each of the seventeen chapters, Burkholder writes a summarization paragraph titled, “The Strides She Made,” which gives readers a quick sketch of each woman’s life. This book is obviously too long to read aloud in one sitting, but it would be a fantastic chapter-by-chapter read aloud for an older elementary class such as second, third, or fourth grades during March, which is Women’s History Month. Burkholder is not only passionate about women’s history, but she also passionately works at motivating and helping women and children. The first portion of 17 Women Who Shook the World has two of Burkholder’s brief motivational writings entitled, “Learn the Secrets for Embracing Highly Effective Lives” and “A 24-step Program for Achieving Your Dreams.” These two essays combined with the main text create an incredibly motivational and informative book. It’s a must-have for any older elementary classroom. Happily-ever-after isn’t as easy as it sounds. King Christian and Queen Marigold are as much in love as ever. They are thrilled with their new baby girl, Poppy. Marigold thinks the only thing she has to worry about is what gifts the fairies might give at Poppy’s Welcome Party. Then, the unthinkable happens. 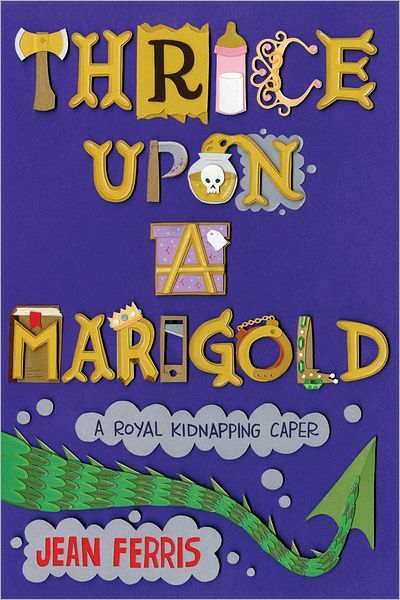 Princess Poppy is kidnapped by the ex-torturer-in-chief and the ex-poisoner-in-chief as revenge for losing their jobs when the evil Queen Olympia was removed from the throne. That was in the prior books of the Marigold trilogy. This book brings in Phoebe and Sebastian, the children of the Terrible Twos, Boris and Vlad, the torturer and poisoner in question. They are ashamed of their heritage and keep as low a profile as possible. Phoebe is the librarian and Sebastian is a blacksmith. Phoebe intercepts a message about the kidnapping and, with Sebastian’s help, tries to alert the castle that a plot is brewing, but they are not in time. They ask if they can go along on the rescue mission because they know Boris and Vlad better than anyone. They each have the secret desire to make up for the bad things their fathers have done. It seems, too, that Phoebe and Sebastian understand one another better than anyone else ever has. The madcap rescue has all the elements of an epic adventure: royal guards, a retired wizard, an elephant and a fire-breathing dragon as well as a dramatic rescue of both baby and mother. There could even be love in the works, too. With a delightful, tongue-in-cheek voice and zany plot twists, this would be a great class read aloud. Students might demand to hear all three books in the series! 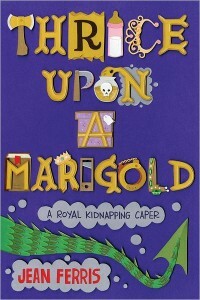 Jean Ferris says on her website (http://www.jeanferris.com/) that she had no intention of writing a sequel to Once Upon a Marigold, but, in that story, she wanted to give her readers the message to be ready for whatever comes along in life. She now has written two more Marigold books and introduces readers to Phoebe and Sebastian. These two characters have not had an easy life. A Venn diagram could be the perfect way to compare Phoebe and Sebastian’s character traits as a literacy activity. Thrice Upon a Marigold would make a fun book trailer, too. Why does Shakespeare endure after over 400 years? It’s not the stories told. Everyone agrees that his stories are mostly borrowed from other sources. Although most of the stories are very appealing. It really doesn’t even matter whether he was the blue-collar bard from Stratford-upon-Avon or some nobleman looking to hide his body of work. He endures because of the language. If there wasn’t a word to express his thoughts, he made one up. As a means of introducing this language to fifth graders and above, Foster created a series of works called “Sixty-Minute Shakespeare.” This is the seventh in the series. In these volumes, he condenses some very long plays for those with short attention spans. All of the language is Shakespeare. He tries very hard to preserve that language. Remember: even the bard was constantly tinkering and cutting scenes, so condensing has a long tradition. As a play, the work is meant to be performed. The stage directions and blank space for notes are useful toward that end. Foster even includes a section on how to perform what he calls stage combat, including slaps. Of course, this makes the book itself the ultimate reading activity. Just perform the play. 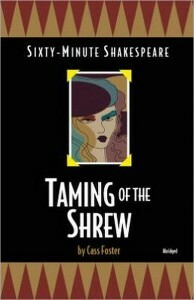 The author’s page on the publisher’s website, www.getshakespeare.com, also provides a lot of information for teachers and the merely curious. 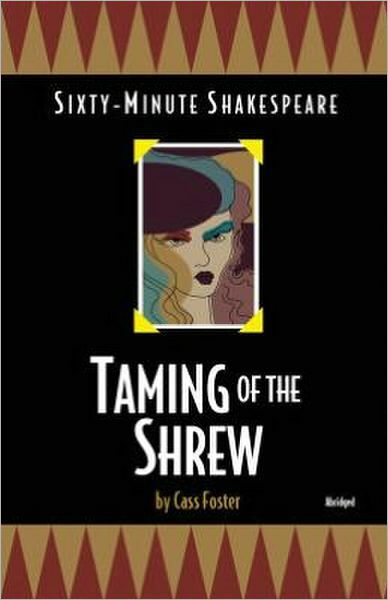 As a story, Taming of the Shrew is firmly entrenched in the world of sixteenth century England. A younger sister cannot marry until her older sister finds a husband. The older sister refuses to be obedient and demure as women of good breeding were expected to be. But the themes of social status and the roles of women are universal. The scheming and interactions make the play exciting and fun. The treatment of women is not politically correct for today, but the play is very funny if you can ignore that. Ready to cook? Here is another book in the “You’re the Chef” series. Recipes include Eggxtra Tasty Bake, Simple Black Bean Salad, Tortilla Tower, Crispy Tofu Sticks, Curried Potatoes and Rice, Who Needs Meat Sloppy Joes and others. 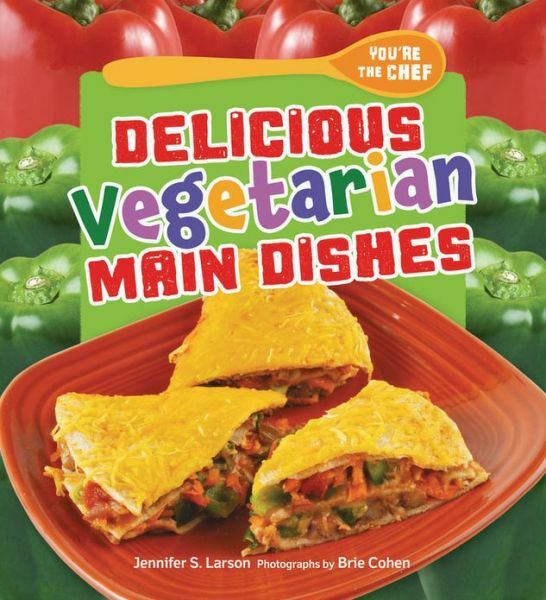 The recipes are vegetarian but not vegan. The photographs are so mouth-watering that anyone will want to get in the kitchen and start cooking. The recipes use mostly fresh ingredients and, even though there is an allergy alert in the opening, the recipes are mostly free of those allergy foods. The author developed these recipes with her boys, so they are plenty kid-friendly. Every step in each recipe has a diagram of the mentioned cooking technique. The safety tips and advice about cooking are smart, without talking down. There are definitions about everything a young cook needs to know: an informational graphic of cooking tools, a diagram with each recipe for the appliance needed to prepare it and a glossary of special ingredients in case a young reader doesn’t know something like cilantro or couscous. There is an index and a section of other readings and websites. The reading level is 4.7 making this a very accessible how-to book. A solid recommendation for those “how-to” units especially if the literacy activity is to make or do the thing described in the book. The publisher has an additional recipe and other downloads on their website with a log-in: (https://www.lernerbooks.com/products/t/11665/9780761366355/delicious-vegetarian-main-dishes). The series has several other titles.